Overall: The advantages of VidCruiter are the benefits the program gives to our hiring managers. They can review interviews at any time and any place as long as they have an internet connection. They aren’t limited to sitting at their desks in their offices watching video interviews when other work needs to be more of a priority. Also, any number of managers can review the same recruitment by sending individual links to them. Managers can also review the interviews by question which allows them to view how each candidate answers a specific question making it much easier for them to grade. On the candidate side of the program, the interview can be set up to allow them to make a few attempts before they finalize each question. In addition, it allows the candidates to view the questions in advance to be able to prepare their answer. We receive mixed reviews from managers. Some don’t want to use the program while others are excited to try it out. Our recruiters sell the concept of using the program and communicate the advantages to managers. We have had greater success when we provide more information. The downside to VidCruiter is that it is moderately challenging to learn. Once the program is understood, it’s fairly easy to navigate but it takes using the program several times to become familiar with it. The user interface is pretty straightforward. In addition, VidCruiter does not have a user manual to refer to in the event of a question, though customer service is usually available to answer questions as they arise. A user manual would be a nice addition. Also, many applicants opt out of interviewing if they have to do it on video. This would be the case with any video interview program. The agency could be missing out on great candidates if the candidate chooses not to interview. Another challenge for applicants is the availability of a computer with a web cam. Our agency will assist with providing a place for those candidates to interview, however, it is an inconvenience for the candidate. Overall, I think VidCruiter is a good program. We have heard from other agencies that use a different program and have heard that it is much more difficult to navigate. This program specifically requires the candidate to download a separate software program to their computer or phone to be able to connect to the program to interview. Recommendations to other buyers: Overall, this is a good product. As far as video interviewing software goes, I understand that its the most user friendly in the industry. Comments: For the most part, candidates report VidCruiter is easy to use. There are of course issues with platforms and software every now and then, but these are a minority of cases, and customer support is so excellent that I don’t feel these cases are a detriment to our hiring goals. Every case is solved expediently. I especially appreciate that customer support will call my candidates directly, so the responsibility for solving the issue is on VidCruiter and not my candidates or me. In this arena, Remy deserves praise. When I call for help, he almost always answers the phone, and when he doesn’t, I get a return call promptly. He’s always courteous and clear, even when my questions belie human error or lack of understanding on my part. Principals love VidCruiter, specifically the video interview and the references. 1. Video interview — Last year, our initial screen was a phone screen conducted by me. I would share my notes and ratings with our five principals for them to decide whether they wanted to use their limited and precious time to schedule a phone interview. This year, we use the VidCruiter video interview in place of the initial phone screen. My principals report that they feel much more confident moving forward to phone interviews based on the video interview. They also report that there have been far fewer “dud” phone interviews this year than last year, meaning the video interview has provided far more useful information than our phone screens last year. 2. References — Last year, one of the principals would call each reference, take notes, and share written notes with the other principals. This year, all 5 principals can read each reference’s words directly. The potency of the references is greatly augmented. Also, I’m able to ensure that all references have been collected by a certain date/time, so we’re able to make hiring decisions much more quickly than before, when we had to wait to catch references on the phone. Pros: Extremely easy to use. Saves time and money. Cons: Reporting options could be enhanced. Overall: The VidCruiter software has significantly helped us streamline our recruiting initiatives. The product design allows complete customization of the entire application process. VidCruiter has enabled us to efficiently screen thousands of applicants and hire qualified candidates. The support team at VidCruiter are both helpful and responsive. Highly recommended! Cons: there are no cons that we have regarding Vidcruiter! Overall: Vidcruiter has been an amazing site to use for our recruitment and training needs. Our rep from the start, has been incredibly helpful in assisting us on how to use the site, and always willing to fix any problems we have. With the amount of applicants our company receives daily, Vidcruiter has made the process more efficient, and helps us filter out candidates without us having to call each individual. Very happy with the service and site! would recommend this to all companies. Pros: The ability to easily use the software. There are many features that assist in the hiring process. Cons: Software not able to block applicants who apply with more than one emails. Some test scores has to be manually scored. Overall: Quality candidates have been selected through the testing that Vidcruiter has and we are able to screen applicants better. Pros: Very robust, flexible, and well designed, easily configurable. Overall: The team is great to work with and they totally understand your business needs and will offer direct solutions rather than workarounds. The Product itself is very well designed and easily configurable to customize your needs on the fly. No need for custom coding in most cases. The company listens to their customer needs/Feedback and adjust/upgrade the product roadmap accordingly. Recommendations to other buyers: Just try it. Pros: Customer support and availability to customize features to suit as needed. Cons: A lot of features I personally don’t use so lots to look through. Overall: I can’t imagine any feature that is not available that can help in classifying, sorting and screening applicants. The customer support (CS) is always friendly and available with a very fast response time. I have found that if I do not have time to go through my own site to make a change, CS is happy to make it happen for me and lets me know when it’s complete. Alternately, if I wish to know how to make changes, (CS rep) has been available to guide me via written or on screen navigation and has patiently walked me through instructions. We are very happy with VidCruiter. Recommendations to other buyers: Customer service and reliability trumps all. Pros: Vidcruiter has great, responsive customer service. The software ultimately does save time with our on-boarding process. Pros: I love how easy it is to post a job, you simply follow the numbered steps. I love how we now have a template we can use for jobs we often post. I have not had an opportunity yet to use the scheduling feature, however, I’m looking forward to trying it. Cons: I do not like that we are not able to sort our jobs by year. It would be easier for us if there were folders by year we could create and keep those jobs in the appropriate folder. Overall: I receive a response to an email or voice mail in a matter of minutes. If they do not have the answer right away, they acknowledge the inquiry and get back in a reasonable amount of time. My dealings are mostly with our rep and the service is always friendly, intelligent and professional. Great customer service! The software is easy to use and I find the different pages well displayed/easy to read. The VidCruiter recruitment software is 100 times better than the other application my company used. Pros: I can add unlimited amount of position in this system, I can add pictures to the system, I can send a delayed email to candidates, I can send report on each product, This is linked with out payroll department. Cons: Not being able to blacklist a candidate, not being able to have the question rotate, our evaluation not being scored individually (but this is being worked on). Overall: I can really go paperless. Pros: We get all the information we need from the candidates as opposed to our recruiters doing the pre screening interviews. It saves us a tremendous amount of time. All the information we need is in one spot. Great for profiling. Overall: We have been using VidCruiter for almost a year now. We do a lot of recruiting at the front line agent level in Canada and Jamaica. Vid Cruiter has helped us become more efficient by allowing us to have our entire recruiting process in one data base. Everything we need is at our fingertips. Rep was extremely knowledgeable and guided us through the entire set up process. He always had time for us. Pros: I found Vidcruiter to be a novel concept and a helpful element o the recruiting process to an extent. Overall: Recruiting has been made easier with Vidcruiter. Pros: It is easy to use, the filter feature, it stores all the candidates information. Cons: It doesn’t show the exact date a position is posted only month and year. Overall: VidCruiter has made may job so much easier. It allows us to hire the right candidates and it filters out the ones we don’t need. (Saves so much time). I want to thank the VidCruiter Team for all the support with this application. Recommendations to other buyers: You can use the for Internal and External applicants. 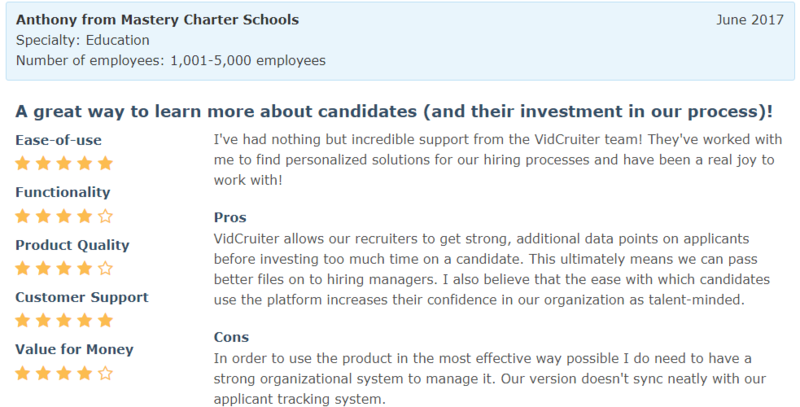 Overall: VidCruiter is a great applicant tracking system. The staff who I work with is amazing! He is very patient, friendly and very knowledgeable and will guide you step by step in the process. Cons: Consumer based errors require correction on our end. Not a VidCruiter problem. It’s a user error problem, but requires some function. Overall: When it comes to using a Video Interview service, the options can be daunting. This one, and only choice is VidCruiter. Simply put, if there are any issues, the VidCruiter team is on the case and ensuring that everything is working smoothly. Other companies should study the VidCruiter model. Pros: Customizable to meet all our needs. Overall: Our school network has been using vidcruiter for a little over a year. We have been very pleased with the product. Our applicants have not had a trouble accessing the video interview software. The customer service is an excellent customer and the customizable software to meet all of our needs. Pros: Its user friendly, functional, technically sound and applicable. I especially, like the feature for uploading of resume and application letters. Additionally, the live interviews hyperlink and notes are also good. Overall: We implemented this tool in our recruitment process in 2015. We hired bunch of people for Marketing, Recruitment, Sales and Consulting teams. 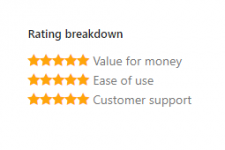 Costumer support is great, whenever I needed help I would always get immediate answer and support. The tool is easy to use, the functionality is structured and organised. I had great experience, and considering that I am very demanding person, I was happy with the application and costumer service we received. – Fully hosted, no need for hardware or any additional software. – Saves a lot of effort and time compared to traditional methods, and is the best way to recruit from other provinces or countries. Cons: Needs a bit of training and getting used to. Recommendations to other buyers: I have seen similar products on the market tapping into the mobile recruitment or video recruitment space, but I like the service and support of VidCruiter. Comments: I love being able to see possible candidates before offering them in-person interviews. We can easily customize our questions for the different positions and now watch the responses two times as fast! Recommendations to other buyers: Use it you will not regret it! 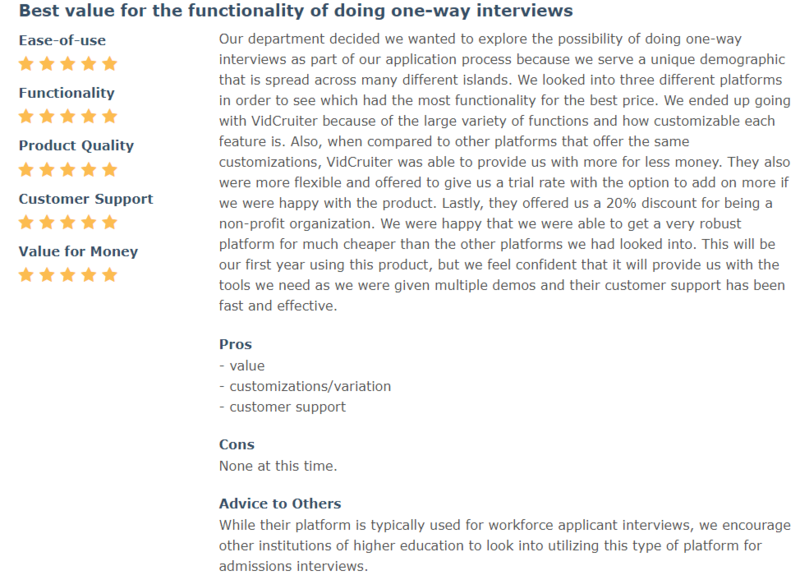 Overall: Vidcruiter makes the process of interviewing thousands of candidates so much easier. The staff is always quick to help and answer any questions for both our team and potential candidates. 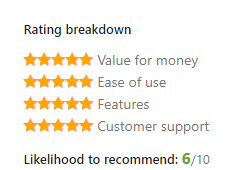 Pros: dependability and the formatting, it is very well laid out. Cons: I really could not complain about anything. Overall: I have been using this software since spring of 2016, it has simplified the complete recruiting process, as well as saving a lot of paper. 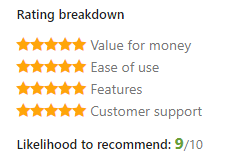 Very user friendly, and dependable. Pros: I like the accessibility of the videos and that I can even do reference checks with them. It makes my job so much easier and faster. Cons: The aesthetics aren’t always great. It can look a bit “bleh” and doesn’t look like it’s as tech advanced as it actually is. Overall: I have found VidCruiter easy to use and navigate. Our candidates have reported a pleasant experience. I have always received great customer support. Comments: We initially joined VidCruiter as a way to expand the amount of candidates that we’re able to consider and allow for candidates who might have weaker candidates initially to be considered. What we’ve gained from using VidCruiter is a more accurate and insightful read on candidates by being able to see their face and hear their voice. This has impacted both our recruitment team and the hiring manager that we work with. They have LOVED getting to know candidates in a way that feels more personal to them through the use of VidCruiter. Pros: Love this site, mostly for how you can screen a candidate prior to an interview. Cons: Navigating the site overall can be a little tricky if you’re not VERY familiar with it. Overall: This recruiting tool takes a lot of the guesswork out of virtual recruiting especially with telecommuting positions. I love the video interview process. Comments: We started working with Vidcruiter over a year ago. We are a fast paced growth company with a global footprint and needed recruitment software that was professional and reliable whilst still customisable to our requirements. Working with Remi and Sean at Vidcruiter has been fantastic, they took the time to understand our business, produced a fit for purpose tool and continue to tweak and refine things for us and the responsive customer service is first rate. Cons: I have made a few suggestions of things I would like to see or have looked into. I have been told I am on a list for IT to look at but it has been months with no feedback. 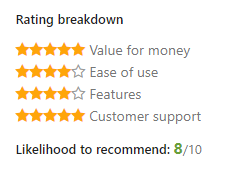 Overall: Customer support has been an amazing help with all my Vidcruiter needs. Vidcruiter is very organized and allows me to do my job with ease. Overall: Good use for remote & sales interviews. We have continuously using vidrecruiter & obtain great use & results. Pros: It is user friendly and help finding information is easy. Cons: Creating reports and uploading and downloading attachments. Overall: VidCruiter is has been an interface that makes tracking and sharing video interviews from applicants extremely easy with our hiring managers. It allows for candidates to complete interviews at a time that is most convenient for them while allowing us to get the information we need in moving along the recruiting process. Comments: I have been using Vidcruiter for 2 years and am continually impressed by their speedy customer service. No matter when I reach out with a question they are quick to respond and helpful. I had never used a video interviewing platform before my company started using Vidcruiter and it has really impacted our process for candidates. It allows you to easily have multiple users accessing the platform. Cons: There can sometimes be minor technical issues, and it can take a little long to learn how to use. Overall: I have been very happy using Vidcruiter. They have extremely good customer service, and their platform is very robust. Comments: Being a call centre, we are able to find the best candidates to conduct an in-house interview as we have a voice recording of applicants along with their resume and their answers to our online interview. As compared to only reviewing possible candidates by their resume, Vidcruiter saves time and labour resulting in only interviewing the best candidates for the position. Comments: We have been working with VidCruiter for 5 years now and we find them to be innovative and very supportive. Any questions we have are always answered quickly and they are constantly working at making enhancements to the product to help in meeting our ever changing needs. You are always made to feel important! Comments: We first contacted VidCruiter to help us develop volunteer recruitment software for a project that would require the intake and management of over 300 volunteers. The software not only satisfied our needs but exceeded them as we learned the possibilities. VidCruiter were also very responsive to our very specific needs and turnaround times were very quick on our requests. Comments: Vidcruiter is reliable and customizable and has streamlined our internal recruiting process and improved overall efficiencies. VidCruiter is dedicated to continuous improvement and is always looking for ways to improve the experience for its clients. Limitations remain as it pertains to reporting and data exporting but they are looking at ways to develop both. Comments: The team built out an incredible custom software feature for us which we cannot imagine living without now that it is fully integrated into our recruiting efforts. It was an incredibly easy process for us to set up thanks to the customer support staff taking the time to sit down and speak with us about what we wanted and what we needed and to subsequently deliver on time. Comments: I can speak only to the VidReferencing service provided by VidCruiter, but it’s certainly saved our company valuable time and resources. With technology ever-changing, companies are constantly seeking areas to streamline processes – we hit a homerun with this one. Comments: We choose VidCruiter over others because of the personal attention and straight forward answers received from the team while we were searching. Setting up was quick and easy and our clients and candidates have found the site easy to use as well. It has really saved us time and added value to our services. Comments: I have been using VidCruiter for about a year now, and have never really used a platform like it before. It’s great for making the prescreen process easier and organizing your applicants, but due to a lack of some functions, it can be a tedious process sorting through everything. Overall though, it helps get the job done. Comments: We are very pleased with the new functionality of the system and especially the customer service we receive from Remi Gaudet. He is very knowledgeable with regards to answering all of our questions with great knowledge and enthusiasm. Comments: I have enjoyed using Vidcruiter for the past three years. I use Vidcruiter on a daily basis and it is super easy to use. I also feel that our candidates find it easy to use and the customer service team is always willing to help our candidates out if they have questions. Would highly recommend. Comments: We have used VidCruiter for several years and the hiring of more than a dozen analysts and associates. It has significantly reduced the time consumed in scoping and interviewing candidates, saved us money and improved our hires. Comments: The team is always super responsive and incredibly helpful. Any time my team or I have an issue, our rep is on it, right away and usually circles in less than 24 hours with a solution. Comments: Vidcruiter has saved my life as a small business recruiter with limited capacity. The customer service is incredible and they have revolutionized how we recruit. Comments: Need more customizable reports. For example, I would like to create a report that will show where (school locations,) where each applicant has applied in one report (i.e. John Doe, KIPP Durham, KIPP Gaston Primary and KIPP Halifax). Comments: Reduces the time it takes to evaluate a candidate and keeps things very organized dealing with thousands of applicants. 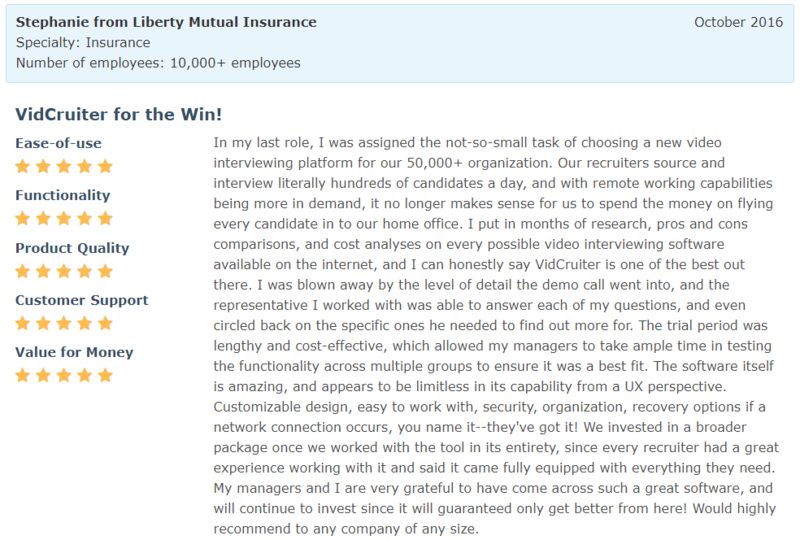 Comments: We had a wonderful experience using VidCruiter as part of our recruiting process. It’s a wonderful service, with great customer support! Vidcruiter allows you to build video interviews (pre-recorded and live) and assessments directly into an automated hiring workflow in the platform. You can customize the workflow to match your company’s processes. Interface is intuitive and easy to navigate. It has the standard ATS features – jobs page, customized candidate questions and rating system, job templates, resume/attachment upload, automated emails, customized notifications, etc. – in addition to the ability to customize screening video questions/options and share applicant videos easily with hiring managers and others in the company. We liked that you could do multi-party video conferences in the system and record them (useful for video interviews where hiring managers are in different offices). Videos can be recorded on PC or on mobile, which was key for us with so many people using their mobile devices nowadays. There is also a built-in calendar integration that allows for automated scheduling and allows you to see the times you and other users have free on your calendar (we use Outlook/Office 365). Vidcruiter’s implementation and support team is very friendly, helpful and responsive (shout out to Remi, Sophie and Sophia!). They are knowledgeable of their product and customer needs, provide good training, and are quick to offer solutions and get things done when you have requests for updates, customization or how-to information. Didn’t really dislike anything but the reporting could be a bit more robust (they are working on adding more reports currently) and we did have a few applicants who experienced tech difficulty connecting to the live video conferences, some of which can be caused by web browser security settings, and sometimes can also be user error (tech ability is actually one of the things we are testing for) or poor internet connection, and VC has recently implemented a new video protocol that has made it even easier. For the most part, applicants are able to connect and use it easily (VC has easy step by step instructions with screenshots and a tech check, as well as online chat to assist with this). If you use video and/or assessments as part of your hiring process, Vidcruiter is a good option! We use pre-recorded videos as part of the hiring process and it had previously been very difficult and time-consuming to manage this manually. With Vidcruiter, it’s all right there in the ATS. The videos are recorded through the system and they are automatically part of the candidate’s record. It’s easy to break them up and review them by question. It helped us to not have to spend a lot of time managing video being submitted in a whole bunch of different formats and via email, Dropbox, etc., which was then difficult to share internally and track. It also automated our assessment process. We use a number of accounting assessments and the process used to be very manual – emailing PDF to the candidate, emailing back, following up, saving in a separate network location that wasn’t in the ATS with the rest of the applicant info. With Vidcruiter, assessments can be associated to specific jobs, and the link and instructions for the assessment are sent directly to them when you moved them to that stage, and they had a certain amount of time to complete the assessment, and you are automatically notified when it has been completed and the completed assessment was saved in the candidate record where it could be graded. The key thing was that the videos and assessments were built right into the system – you had everything in one place and weren’t managing it all manually through email and across multiple systems. It’s a good solution for companies that use videos and assessments as part of their hiring process. There are so many things to love about using Vidcruiter. We would not be able to operate at the success rate that we are without their awesome applicant tracking system, the user-friendly platform, the organization of our applicants into unique folders, the instant responses received from their Client Success Team and personalized one-on-one training with our new hires. While we do not have any dislikes of Vidcruiter and their services, for our company specifically and the amount of scheduled and rescheduled interviews we have, combining the same applicant via email address into one Vidcruiter profile with all the history & notes included would make researching their progress a little easier. You will not regret integrating Vidcruiter into your company’s hiring process. As a new start-up company in November 2017, we were more than overwhelmed with the number of applicants that we received for our international tour guide search. With Vidcruiter and the awesome Client Success Team, we have been able to organize our incoming applicants, we are conducting high-quality live video interviews and have the option to offer a self-recorded video interview to applicants that are far outside of the US time zones and regularly conducted business hours. Vidcruiter has given my company the opportunity to maintain our database of applicants (hired and not-yet hired) in a very secure and well-organized fashion. Customer support is amazing! I have not had any issues with the software but anytime I have had a question or request, the Vidcruiter team has always been very responsive and have gone the extra mile for me / my colleagues. Also, the software has allowed us to interview more candidates in less time and we are able to make a hiring decision much quicker than before. Honestly, the only negative I have experienced was on the applicants end (ie. they did not read / follow the instructions) but again, whenever this has happened, the Vidcruiter support team has been amazing and I usually have a response within minutes of my email. Vidcruiter has significantly reduced the time we take from advertising a job process to making a hiring decision. The customer service was great– very hands on. Vidcruiter staff helped us throughout the entire onboarding process and then actually continued to assist us throughout our entire engagement with them! No questions were ever left unanswered. They were also able to create some workarounds for us when our hiring required some special circumstances– very accommodating for all our needs. Nothing to note here! Very satisfied with all aspects of the service. A couple glitches from time to time but that’s to be expected, and all were handled promptly. It was a huge time saver for us– allowed us to easily interview candidates from all across the country remotely, and in a way that still felt personal. 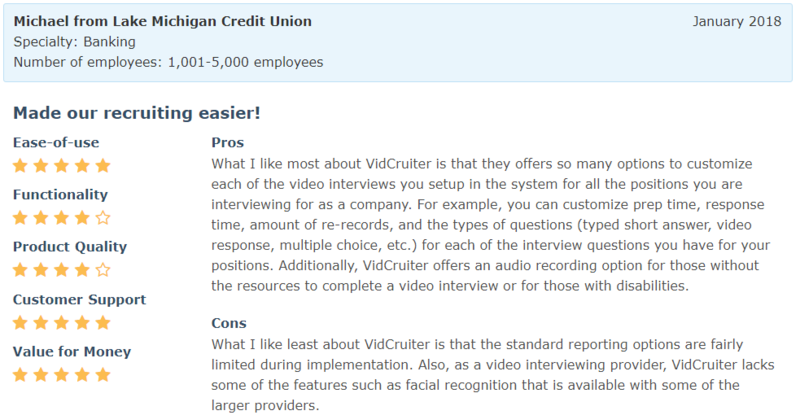 Vidcruiter is so easy to use for interviewers and candidates. The support team is super responsive. We’ve used Hirevue and Kira Talent and neither of them has the support team and features that vidcruiter provides. I love that you can customize the interface for your own company. The very few suggestions I had were implemented! Vidcruiter provides a positive and easy candidate experience. It saves time and money for interviewers. More efficient all around! The level of service provided so far has been tremendous. Quick answers to questions and they handled all the set up for us! So far, there has not been anything at all that I disliked. We are using the pre-recorded interview process to help us screen applicants to specific positions. We are just in the beginning stages but can already see that having the videos provides us many additional factors to rate applicants on. Our first year using the program and a process working together with the Vidcruiter team to create and customize a system that fit our needs. We have used most of the functions that Vidcruiter provides and have had much success. For our highly extensive and customized purposes, there isn’t much to dislike about the program. I consider what we may do differently for future use and how to make its current functions work best for us. The team are extraordinary and they have gone above and beyond to make adjustments and customize Vidcruiter to meet are needs and ease of use. Their support and customer service is beyond measure. The program is efficient and very easy to use. Plus you have all the information you need right at your finger tips. Multi-use and accessible as we have many employees who travel or are located regionally, cost-efficient, paperless and a shareable online data bank that we can provide to our HR department, it’s a great information tracking system, access to reports and statistics, ease of correspondence and client information. It takes the guess work out of the process by providing a rating for the candidate throughout the steps. It is an equivalent to a one stop shop for our purposes as we have one system for most functions and one contact for support. Well worth it! VidCruiter has the fastest customer service response! When ever I have an issue in the system I get a response within minutes, sometime seconds! I also really enjoy that our client manager takes the time to explain new tools available in the system. We are collaborating with VidCruiter to help us pre-screen candidates via the Video Interview tool. Customer support are really responsive – they are happy to walk through the process with you and support where needed. It takes a little while to get familiar with the system. It is pretty intuitive though. It allows us to differentiate ourselves from other companies doing the same thing by really enhancing the employee experience and making it easier to connect candidates internationally and maintain a good interaction. The Vidcruiter platform provides significant flexibility for its application – it presents my business in a professional light to both candidates and my clients. I am able to gather significant details from candidates in an easy efficient manner. There is no feature for editing phone numbers entered by candidates if they make a typo. The Vidcruiter platform allows me to provide SIGNIFICANT details to my clients on candidates in a VERY efficient and professional manner. My clients LOVE the Video Interviews completed by candidates to help them decide on who they wish to meet for final face-to-face interviews. Our Client Success Manager, Remi Gaudet, is always available to support my team. He’s made updates to the platform at our request and walks me through any and all questions when I reach out for support. A few of our candidates are unable to upload their videos and they get frustrated. We are using this platform instead of phone interviews. We also have candidates upload a video of themselves teaching so we’re saving a lot of back and forth communication via email or phone calls. The team at Vidcruiter is very responsive to any requests and constantly works to make improvements. Everything is going very smoothly. Love working with the team! Ability to on-board in a paperless environment. Remote hiring with video interviewing. Easy to use. Allows to make changes as require. Job postings are not link with indeed. We have to add manually he ob postings to Indeed. We are a network of charter schools in Philadelphia. Our recruitment team uses VidCruiter software in conjunction with Salesforce. We signed up for VidCruiter so that we could free up recruiter time during phone interviews. We were limited in the number of people that we could conduct phone interviews with, so our process relied very heavily on resume screening. VidCruiter has allowed us to interview FAR more people and to consider people seriously beyond a resume. Candidates enjoy the flexibility in scheduling and the ability to re-record their answers. As a recruiter, it is nice to reserve phone interviews for critical roles or follow up questions.Customer support is amazing. Delightful, really. Replies are fast and issues are resolved quickly. It is very much a selling point that has allowed us to renew for the last couple of years. Customer support is amazing. Delightful, really. Replies are fast and issues are resolved quickly. It is very much a selling point that has allowed us to renew for the last couple of years. Occasionally, video load time lags both as a reviewer and for candidate participants. I’m not sure why. As a reviewer, this means it takes me a bit longer than I’d like to watch a video because it will stream the first few seconds and I have to keep pausing it to let it buffer. I am confident that it isn’t my internet connection because I can easily enjoy Netflix and YouTube without this issue. The way of creating positions and adding questions to positions is a more time consuming than I’d like. For me, this is where I lean on the support team who graciously create positions for me in what seems like lightening speed. We contacted Vidruiter to help us transition from a paper only volunteer application process to an online application process. We knew were going to get hundreds of applications as this was the second year in a row for us hosting the event. The online platform we that VidCruiter developed in very close collaboration with us was superb. As Chair of the Volunteer recruitment and accreditation committee (and a volunteer myself), it was very important to me that I be able to manage the information from the applications and that it be as automated as possible. The product they developed achieved this in spades and I was able to focus more on the volunteer’s experience and assistant the rest of the committee rather than staying on top of all the paper. Working with the staff at VidCruiter was a very positive experience and they grasped what we needed while coming up with their own innovations that were really helpful. Response time on questions was very good and I can honestly say that I always got an answer quickly. As Chair of the Volunteer recruitment and accreditation committee (and a volunteer myself), it was very important to me that I be able to manage the information from the applications and that it be as automated as possible. The product they developed achieved this in spades and I was able to focus more on the volunteer’s experience and assistant the rest of the committee rather than staying on top of all the paper. Working with the staff at VidCruiter was a very positive experience and they grasped what we needed while coming up with their own innovations that were really helpful. Response time on questions was very good and I can honestly say that I always got an answer quickly. Sometimes it can be slow and doesn’t work as fast as I want it to. I use VidCruiter every day to schedule interviews. It is a complete time saver and is easy to use. A great feature is a video-chat option. Love this service!It is very user-friendly even if you have never used the application before. The customer service is also extremely supportive and available. It is very user-friendly even if you have never used the application before. The customer service is also extremely supportive and available. There can be minor glitches here and there but technical support is immediately responsive.